We prove ourselves every day. On every project. That hunger has driven us to some great places: from developing the Experiential Marketing industry’s first global strategy practice, to creating the first complete experiential analytics ecosystem. 1-DATA. We have the industry's best ROI and analytics tool, the GPJ Experiential Ecosystem. 2-LIVE PRODUCTION. Our live production team has produced some of the largest festivals and events in the world. 3-STRATEGY. We created the industry's first strategy practice almost 20 years ago. 4-CREATIVE. 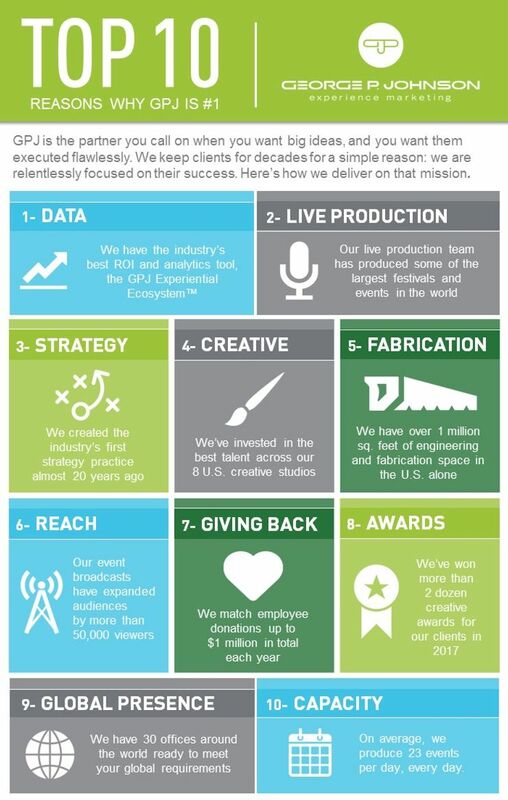 We've invested in the best talent across our 8 U.S. creative studios. 5-FABRICATION. We have more than 1 million sq. feet of engineering and fabrication space in the U.S. alone. 6-REACH. Our event broadcasts have expanded audiences by more than 50,000 viewers. 7-GIVING BACK. We match employee donations up to $1 million in total each year. 8-AWARDS. We've won more than 2 dozen creative awards for our clients in 2017. 9-GLOBAL PRESENCE. We have 30 offices around the world ready to meet your global requirements. 10-CAPACITY. On average, we produce 23 events a day, every day. Learn more about what GPJ can do for you.